Narconon Fresh Start drug rehab program graduates share their own personal success on the program. Narconon Fresh Start Graduate testimonials transcript. My drug of choice was opiates, it started off with me using pills and as the story goes, it leads to heroin. Every, “I never…” said became true. I always said I was never going to do opiates, I never was gonna steal from my parents, I was never going to put a needle in my arm and eventually I ended up with a needle in my arm. In the course of about two years, it progressed from weed and alcohol to cocaine, ecstasy, acid, mushrooms, anything you could really think of. From the first moment, it just hooked me and then I just started to lose everything. I started out drinking and smoking pot. And then it progressed onto pills, pharmaceutical stuff and then up into 16 I started using heroin in an IV use when I was 18 years old. From there my life went down the tubes. I lost a lot of relationships. I ended up losing custody of my kids temporarily. I was locking myself in bedrooms; I was using. The times when I didn’t have electricity, my son would try to wake me up. If I didn’t have drugs, I wasn’t awake. And I didn’t have food for him. Even though I was working I spent my money on drugs. I didn’t know anybody in this house. There were like eight people in this house. I didn’t know a single person. My arms were all scared up. I had all sorts of nasty bruises on my arms. I looked down and realized that I haven’t showered in almost a week. I was wearing some lady’s sweatpants I don’t know. I was wearing somebody else’s t-shirt I didn’t know. I have a bandana on my head because my hair’s so nasty and oily. I was roaming streets. I was living in cars. I was calling up friends to sleep on a couch. I was using McDonald’s receipts to get food. This program is different. This program works. It’s something that really forces you to take a look at yourself and is able to give you those fundamental tools that I think I know I had lost in myself. I don’t want to speak for everyone, but I feel it’s a pretty general thing we tend to lose when we’re out there living the lifestyles that we’re living. And it kinda is able to build you back up from the bottom up to this person that you knew you wanted to be when you were younger; that your parents thought you were going to be, that your friends thought you were going to be. And it’s able to really rehabilitate you and bring you back to a place where you are your self again and you have those options again and you have those abilities again and you can go forward from there. It wasn’t just focus on going to group sessions and telling everyone your problems. They actually helped me get those chemicals out of my body and helped me think clearer and work on my communication skills and deal with these people who were not only affecting me, but other family members. They had me take responsibility, which before I had no responsibility whatsoever; had me work on these states of existence where it’s not only yourself. It’s society, it’s family, it’s life forms, it’s everything. It’s a whole program. It’s just one thing. You have many different aspects for you to look at and you need to look at each one for you to be a happy individual again. I was in about nine other 12-Step programs. I did a methadone maintenance program and none of those programs did it for me. They didn’t work. I don’t put them down at all, but Narconon Fresh Start is the only program that has actually helped me to get tools back into my life where I can apply them and feel like I’m actually doing something with my life. They just teach go to meetings and that you’re an addict. That was kind of the biggest thing for me. Narconon Fresh Start teaches you that you’re in complete control of your life and a substance or a drink or something is not going to have power over you for the rest of your life. That was kind of the key thing that stuck with me, that I’m not this weak man living the rest of my life. I’m actually in control of everything and that makes me very happy. Now I feel like I’m a more responsible, smarter and more caring person with more integrity and values than I was before I even started using drugs. I really feel like a whole person. That’s something that I couldn’t have gotten from those other programs and that I never did get which is why I ended up relapsing. They gave me skills on how to repair my actual life. How to be a more better effective individual in everyday life settings. It really helped me repair my life and be able to move on. Not only stop using drugs; It made me a better person now than I was before I ever did drugs. They were skills that I learned that I never had before – ever in my life. I had used for 15 years. There were mornings were I woke up and thought, “This is it. This is my life and this is what I’ve created for myself and I accepted it. I’ve been clean since 2007 now. Not a day goes by that I’m not eternally grateful for having been sent here. I got things back in my life. I got my family back, I’ve got friends now and I’ve never experienced friendships in my life like I’m able to now. I know what it is to be part of society and in a functioning part of society at that and someone who can contribute to it. Everything that I learned through my program was exactly what got me to where I am today. I will always have that in my mind and I will never go back to where I was. It was a relief when I was done with that to look back and say, “You know what, thank God I never have to face that again.” Because I knew at that point that it was something that I never wanted to go back to. Since I finished the program, I have my family back. I used to call them and they didn’t care to talk to me. But it’s like now when I call, they’re up-tone and they’re so excited to hear from me and we have the best relationship. I talk to my mother everyday. Because of the program, I’ve been able to meet the man of my dreams; the love of my life. We got married a couple of years ago, we bought a house, I’m going to have a baby and it’s like everything is on track. Everything is going great. Everything is going wonderful and everything that I have is because I was able to do this program. Not only do the program, but I’ve been able to apply the program to every aspect of my life. There is not one aspect of my life that is not effected because of this wonderful program. It has given me so much more of my life back and my family that it’s an immeasurable thing that they’ve given me. They gave me the tools and everything that was needed to do it and it’s been up to me to enforce the tools, to enforce the formulas, to do everything that is needed, but it’s something that has made me the happiest person in the world. It’s something that I don’t think I would have ever said a year ago. Narconon Fresh Start has basically given me a new life. I have my confidence back, I am able to handle things in life that come up. I handle them, I handle them appropriately. It’s like I make the right decisions. I have friends that surround me that are good influences. I am just really happy with where my life is at right now. And I couldn’t ask for anything else. Narconon Fresh Start gave me my life back. I now have an amazing fiancé, an adorable baby, a wonderful job, self confidence, happiness, a roof over my head. I just have everything in the world and it’s because of Narconon Fresh Start. Overall, what I got from Narconon Fresh Start is my entire life back. I got trust with myself back, I got good friends, I’m a good employee, I’m happy, I got my personality back and it’s truly real. I’m good with everything, every aspect; my relationships with my mom, my dad, my sisters, my friends. Overall, I’m just so happy and I’m so glad that I went through this and experienced it. And I’m able to be productive and have a good sober life and know that I’m not relying on anything anymore. Call today and find out more about the Narconon Fresh Start program and how it can save your loved one’s life. Drug withdrawal is difficult and painful for many addicts coming off drugs. But Narconon Fresh Start uses a drug-free, natural and holistic drug withdrawal method that helps individuals get off drugs as painlessly and comfortably as possible. During my time in withdrawal I learned how to focus my mind on other things rather than my withdrawal symptoms. I got my appetite back as well as a sleeping pattern. It was great to be on some sort of schedule that way I felt ready to start my program. It was really good to clear my head and figure out my next steps in life! Everyone that helped me in withdrawal, I appreciate it! My time in withdrawal I learned three essential values that I will continue to use. I learned to be aware of my surroundings. I learned to follow instructions. Lastly, I learned the value of being patient. These things will guide me through the rest of my program and help me to accomplish more goals in the future. My experience from withdrawal was amazing. Everyone made it calm and peaceful. I enjoyed going for walks and going to the beach everyday was amazing! The food was delicious. The staff were wonderful. They all helped me in a different way and I would like to thank everyone for all of their hard work. My withdrawal experience was a very good one. I was able to learn to control my anxiety by the time I was finished. My sleep got a lot better and I was able to get my appetite back. The staff was great with with getting us out on walks and took us for trips to the beach a lot. Prior to arriving to Narconon Fresh Start, I had been alone and isolating myself from the rest of society for three years. I was doing drugs and like many others, I was stuck without any answers or outlook for my future. 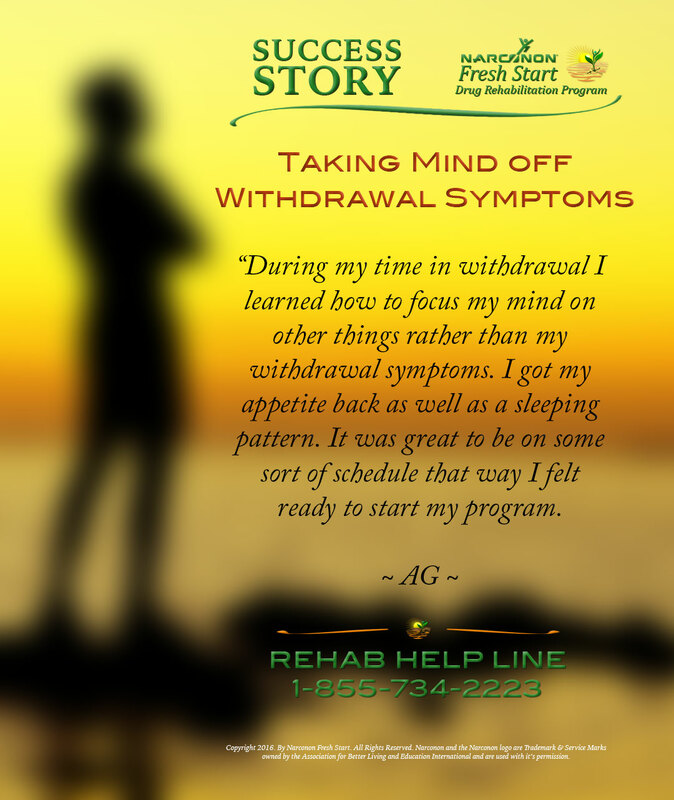 Withdrawal was certainly a positive change which is what I needed for a new start in Life. Thank you.